All transactions are safe and secure with a reliable history in online purchasing behind each of our associates. Buy the Always Be Batman t-shirt to own Batman clothing and merchandise. "Always be yourself! 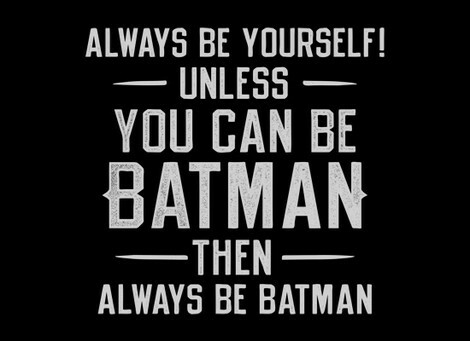 Unless you can be Batman, then always be Batman." Follow these words of wisdom when taking on the Joker, who delivers his own quotes like, "Why so serious?" This can be worn as a funny Dark Knight tee that will make a solid addition to your closet of Batman clothes. As they chuckle at the design, it will have your friends thinking of the Dark Knight quote, "Why so serious?" The Joker is a fun loving guy who truly believes that laughter is the best medicine. This tee follows that same motto as it is showcased among the more artistically serious Batman merchandise. Wear this piece of humorous Batman apparel under a Batman track jacket or a comfy Batman sweatshirt hoodie. In addition to the Always Be Batman tee above, browse the Batman Clothing Gallery for more apparel like men's and women's clothes, kids shirts or hoodies.